Filled with character, this cozy ocean view cottage offers both luxury and comfort. Featuring one master bedroom with en-suite bath, this cottage is perfect for the couple wanting to run away to their secret place. And we also know everyone wants a hide-away so this cottage also fits the bill for getting away by yourself. Named after the Painted Bunting, the decor reflects the colorful male and brings to life the rich blues, greens, reds, and yellows in every detail. Sapelo island is a barrier island off the coast Georgia about 45 minutes south of Savannah. The island is the size of Manhattan but has a population of 70 people. Some say Sapelo has the longest undeveloped beach on the east coast. The island is home to the University of Georgia Marine Institute, RJ Reynolds Mansion and the Geechee community of Hogg Hammock. For further information on the Sapelo Island Birdhouses and Sapelo island please click the link below for additional info. We also manage a cottage on the mainland. The VRBO listing #194368, The Captain's Cottage, is close to Sapelo and offers luxury and a beautiful setting. A marina is present where one can dock their boat. Golf Cart rental available at discounted rate of $35 per day. This was a lifetime experience. The remoteness, natural beauty, and history of the island, combined with the quality and comfort of the Birdhouses was unlike any other vacation trip we've experienced. 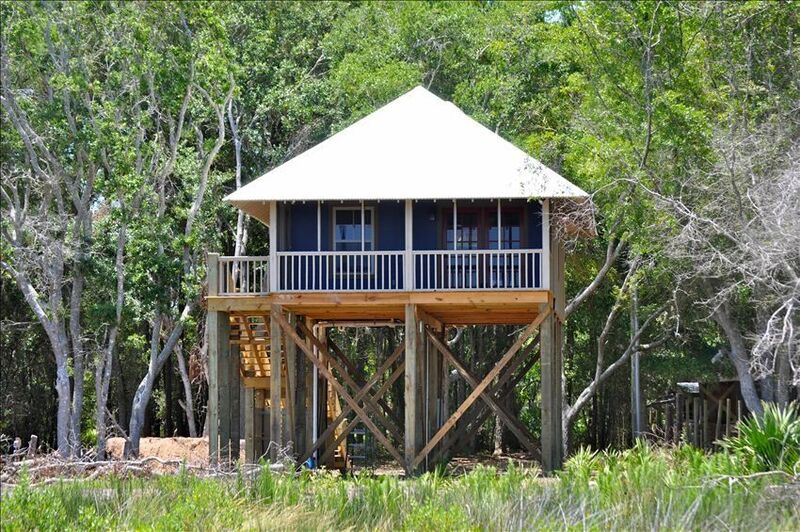 Extremely well-equipped kitchen, a screen porch overlooking the wetlands and the Atlantic, the sound of the ocean. Everything we needed magically appeared: bicycles for exploring, a home cooked dinner, a tour of the North End of the island. We left rejuvenated and recharged. What a wonderful wedding anniversary trip. I had the pleasure of spending 2 nights here with my daughter. We had so much fun and will have lasting memories of out time there. Everyone we met, from locals to other visitors, touched us in some way. I wish I had a way to get in touch. I got some great photos to remember it, but I am already feeling the urge to go back. The Painted Bunting Cottage had everything we needed, including a great view of the ocean. The sunrise on our last morning was as good as it gets and I have photos to prove it. Francine was great and I hope it stays as it is. We had such a relaxing time on this island that we shared with no one. We felt like we had the island to our self until we would meet a local who was picking us up or taking us to the ferry, or delivering bicycles we rented or at the store.....such sweet nice locals. Francine was a charm - thanks for letting us take the "tour" - what a special treat. The house was perfect for the two of us with a million dollar view. We would love to get back during warm months but was still able to enjoy a picnic lunch on the beach and the lighthouse to ourselves. We ran into an artist who was painting the Cabretta bridge/marsh and I can't wait to get one of her prints. Nothing to do on this island....with so many options if you look closely. Beach is beautiful! the everyday grind. Beaches are beautiful. Hello Thomas... we are so pleased to hear you had a great time. You are becoming a regular to the Sapelo Island Birdhouses and we hope you know that we are always happy to see you return! Thank you for your support and we look forward to seeing you again soon! I hesitate to write my review, because I want to keep this lovely jewel of a cottage a secret. I was able to spend three lovely days here with my dog, and we can't wait to go back. The serenity of the island and the warmth of the cottage instantly allows you to relax. I loved the porch, and used it to sip my coffee in the morning and take a nap in the afternoon. The beaches are absolutely pristine and my pup was able to run and play. We have the same feeling about the island too.... it is a jewel on the Georgia coast and so, so special. We are so pleased to hear that you loved the cottage and found the porch to be the perfect spot to start the day and for a little break in the afternoon. We welcome you and your pup back to enjoy Nannygoat and feel the wind blowing against your faces. Sapelo is calling your name! My Husband and I rang in the New Year at this adorable cottage. While somewhat "remote", it gave us the chance to relax and unwind in an upscale, cozy spot. It almost feels as if you are in the caribbean, but without the hassle of getting there. Annita and Bill have provisioned the cottage as nicely as I've ever seen. We've rented lots of homes, mostly thru VRBO, but seldom do they have EVERYTHING you could possibly want or need and very high quality. The beaches are pristine and a easy golf cart ride to get to. Not much else on the island, but who needs anything else? I would highly recommend this rental to anyone wanting to slow down and enjoy a beautiful beach rental. Great owners and very nice service provided from Ferry ride to Ferry ride! Karla...we enjoyed bringing in the new year with you and Don! We are so pleased to hear you enjoyed your stay at the Painted Bunting and that everything was there you wanted and needed. Thanks very much for visiting us on beautiful Sapelo Island! Adventure tours in the salt marsh are available. Inquire when making your reservations.